If there was an award for a president with the most posts on twitter, Donald Trump would win. Even though his trigger “twitter” fingers make for great reporting, after a while you start to wonder, if he’s so busy sending tweets at different times of the day and night, when does he have time to rule the country. North Korea is threatening war against the U.S. and you are worried about some football players kneeling. This country is the “land of the free”. It is our right and our duty to express our opinions when we think something is wrong. Okay, lets rewind for those who don’t know what’s going on. 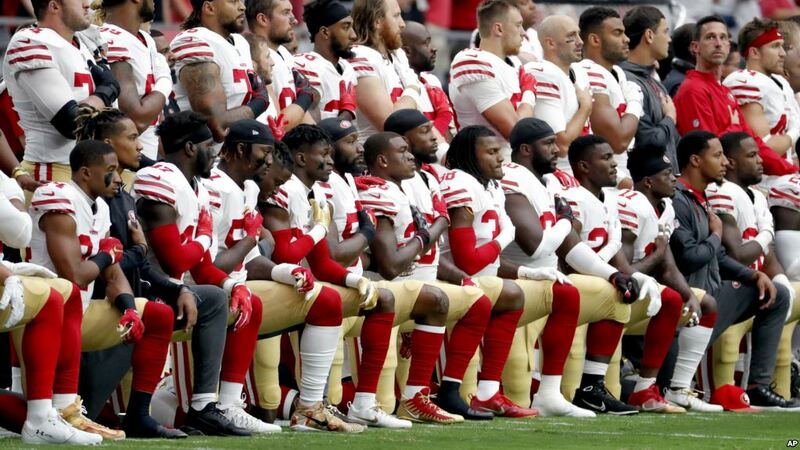 It all started when Colin Kaepernick, quarterback for the San Francisco 49rs, opted to kneel for the singing of the national anthem during the 2016 football season. “I am not going to stand up to show pride in a flag for a country that oppresses black people and people of color,” Kaepernick said in an interview to NFL media. This personal choice became the topic of conversation for several months. Soon afterwards, President Trump told NFL owners to fire the players who don’t stand. So what did the NFL players do, they condemned his remarks, criticized him on Twitter, the Dolphins wore shirts in support of Colin Kaepernick, some teams didn’t even come out for the national anthem. Who can blame them for taking a stand for what they believe is right. So now most recently, during a game between the San Francisco 49rs and Indianapolis Colts, both sets of players along with their owners and coaches consciously kneeled during the singing of the national anthem. All that protesting sparked another comeback from trump on Twitter, “The fans booing at the NFL football game last night, when the entire Dallas team dropped to its knees, was loudest I have ever heard. Great anger” and “Ratings for NFL football are way down except before game starts, when people tune in to see whether our country will be disrespected.” He was obviously very upset that Sunday night, we can assume he watched all the games just to see the players reaction.